The abrupt lack of Multi Room Satellite Television caused the whole family to fall apart. Paid around £400.00GBP (excluding price of Hard Disk) for my Vu+ Duo 2 a couple of years ago – was extremely pleased with it – but over time it did start slowing down & doing (many) slightly strange things for several months (I thought it was the frequent Duo2 software updates – no it turned out that the Duo2 was slowing down etc. because of the failing hardware!) then suddenly my £400+ Duo2 is stuck in standby and absolutely will not come out of standby – and worse still it is totally out of warranty! Vu+ Duo2 Faulty Motherboard -Before Removal- Tuner Module already out, Some cables removed and disconnected – everything still original and untouched just as it left the factory. As it was a big job there is a lot more to read and pictures to compare on this page – so for the impatient – spoiler alert – I enjoyed total success in repairing my stuck in standby Duo 2 while also saving a lot of money – I then repeated my successful Hybrid Polymer Capacitor Upgrade on my other Duo2 (some of the Photographs are from my other Duo2) as well because there was such a big improvement in performance and stability – while the polymer upgraded tuner module shows big gains in signal sensitivity and signal quality and signal lock on speed/performance in the process – read on for more details. 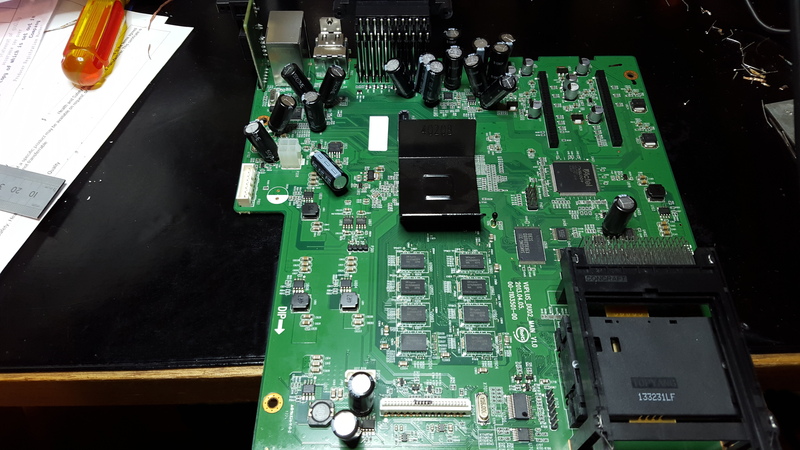 Fortunately I have another (younger and still fully working) identical Vu+ Duo 2 “box” so I started swapping parts over between them – the power supply when swapped over from the dead box would not start the good box (Motherboard etc.) worse still the known to be good power supply would not start the now faulty Duo2 either – meaning that we have both a faulty Duo2 Power Supply Board and a faulty Duo 2 Motherboard to deal with. Studying the Vu + Duo2 power supply there were zero signs of visible failure / damage and it produced 12Volts while under load on all its pins – which matched what was printed on the Power Supply Board itself. Eureka Moment – I realised that the LNB (the device connected to the other end of your satellite dish signal cables) needs either a 13 Volt or 18 Volt supply which switches between the two different voltages to enable you to tune in to all the different Channels (the voltage switches the LNB between Vertical & Horizontal Polarization) therefore half the power supply is on the actual Motherboard itself as there is no other way for the Duo2 Power supply that gives ONLY a fixed 12 Volt output to the Motherboard to become 18 Volts for the LNB except if the Duo2 Motherboard is stepping up the voltage by drawing increased current (amperage) to convert it to a higher voltage on the actual Duo2 Motherboard – which explains why a known to be working Power Supply does not start the rest of the box – because half of the Power Supply Components are physically installed on the Motherboard itself! Sadly that fact also means a far bigger & more complex repair. So do I want to pay for another £400 Vu+ Duo2 or spend over £100 on Capacitors? I do have a second Duo2 but if that also fails I will be down £800 – lets buy some Capacitors! 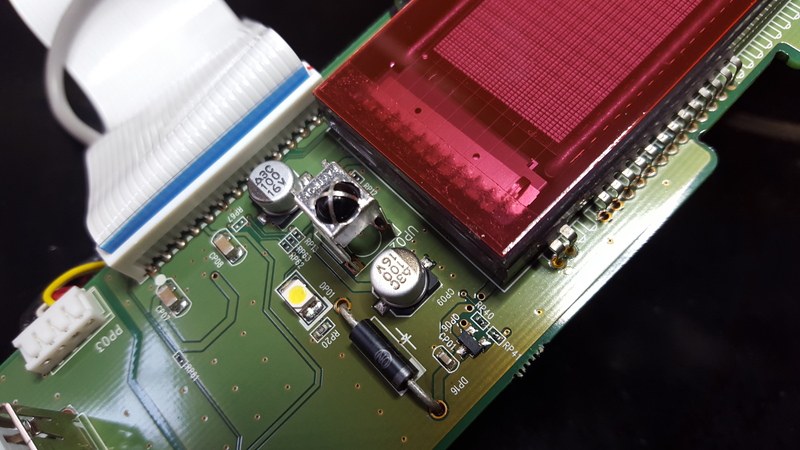 Proof of Concept Phase – As I would have to order from multiple different suppliers I initially only ordered the Power Supply Capacitors along with a few others at the same stockist to satisfy their minimum order value & quantity requirements. Having de-soldered all the old Power Supply Capacitors I soldered in all my new upgraded Japanese Capacitors and put the rebuilt Power Supply into my other (still working) Duo2. Vu+ Duo2 Power Supply now working again having been Rebuilt and Upgraded. The Capacitors are DELIBERATLEY angled AWAY from the two big heat sources – the silver and black heat-sinks. Moment of Truth – It now works! 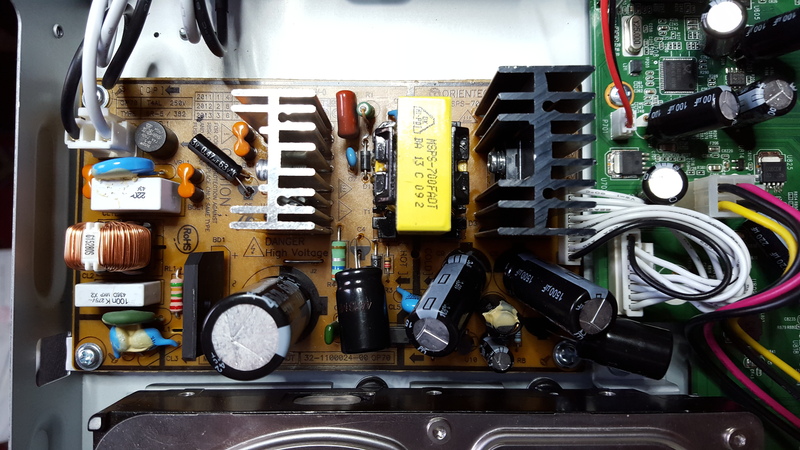 The Power Supply from the faulty Duo2 now works in my other Duo2 – before it did not work in either Duo2 – so the original Duo2 Power Supply Capacitors are proved to be faulty! Hoping Against Hope – I tried my (now also proved to be working) Rebuilt Power Supply with the faulty Motherboard in my other Duo2 – it does now start booting a little from cold (before the Power Supply rebuild nothing much at all seemed to happen – with similar symptoms when powered on the other Power Supply) but then gets stuck – Hmm…. Defiantly Undeterred – I finally pay up and order the rest of the capacitors from two other suppliers while putting the rebuilt Power Supply back in my other still working Duo2 to see if it is stable in use – in fact it is far better than before with much faster power on & boot up from cold times, better on screen colour rendering, better audio, quicker menus etc. 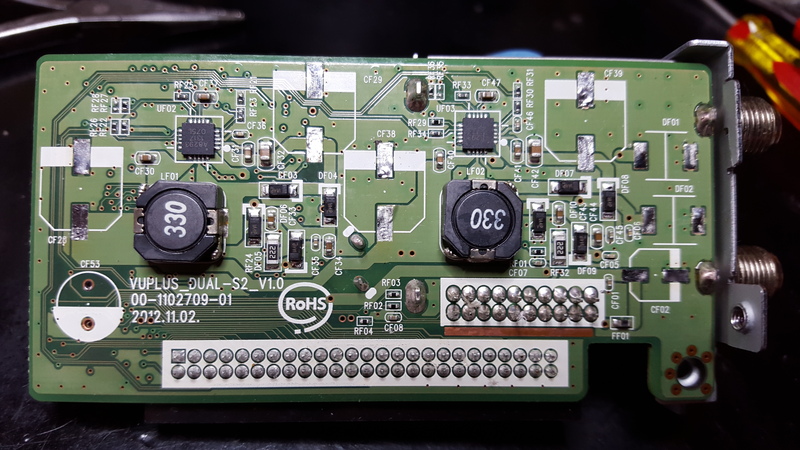 all of which implies that the other Duo2 Power supply is past its best or on its way to failure – anyway my current priority is to fix the other Duo2 Motherboard. 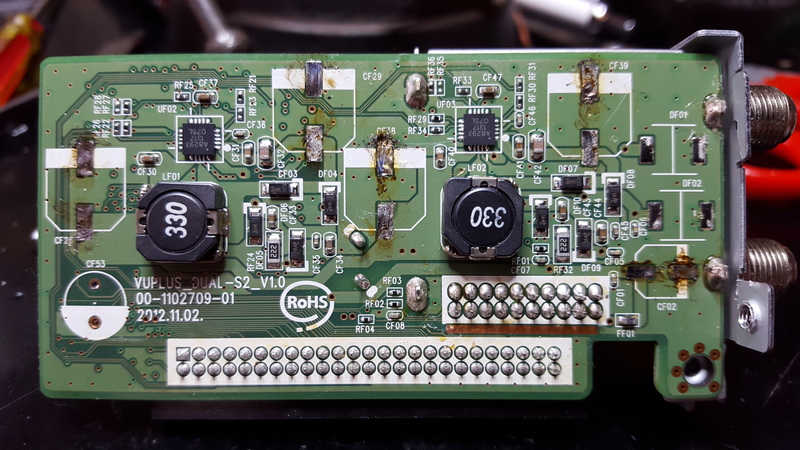 Soldering & Soldering – Wear a Respirator NOT a dust mask AND take full ESD (Anti-Static) Precautions (details later). The rest of the imported Capacitors are finally delivered and I start working on the failed Duo2 Motherboard – unlike the Duo2 (single sided single layer circuit board) Power Supply the Duo2 Motherboard is a marvel of circuit board miniaturisation – meaning a dual sided AND multi-layer circuit board with a combination of conventional and SMD (Surface Mount Device) components (including some of the suspect Capacitors) and also with plated through (solder) holes – this is not something for the inexperienced to trifle with – one small slip of the soldering iron (or de-soldering tools) will remove one of the many tiny SMD passive components that are next to most of the suspect Capacitors – you have been warned – while I have experience, love a challenge & should know better so immediately I get soldering steadily removing old Capacitors by de-soldering then soldering in the replacement bigger & better Japanese capacitors – the work is slow going so I decide to see if I can get away with only replacing the conventional (non-SMD type) Motherboard Capacitors. As it turns out – no you can’t! Although the box now starts up and responds to the remote control it is wildly unstable with not all channels working – but it is definite progress as the faulty Duo2 now boots up, runs and produces a picture! First two SMD Capacitors are soldered in – six more still to install. 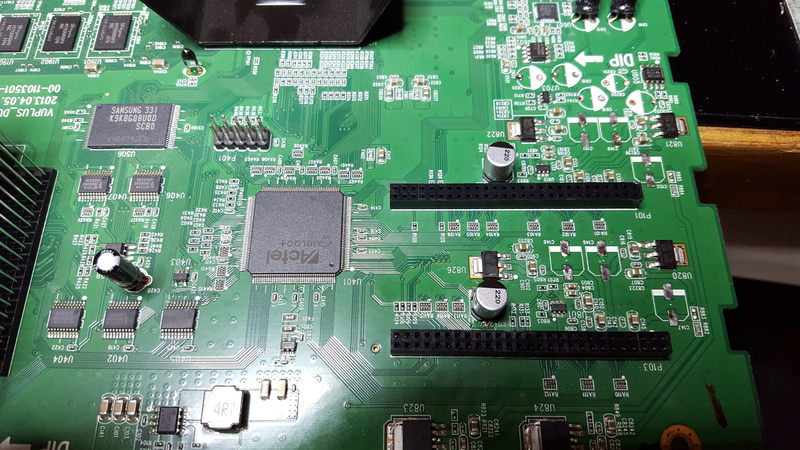 Every single Capacitor has now been changed on this Vu+ Duo2 Motherboard – They are deliberately fitted in at an angle otherwise you cannot fit in these bigger 10,000 Hour Life Capacitors – The original 2,000 Hour Capacitors just did not last – Which attribute do you value more in a Capacitor? Long Lifespan? OR Small physical size to enable you being a neat freak? 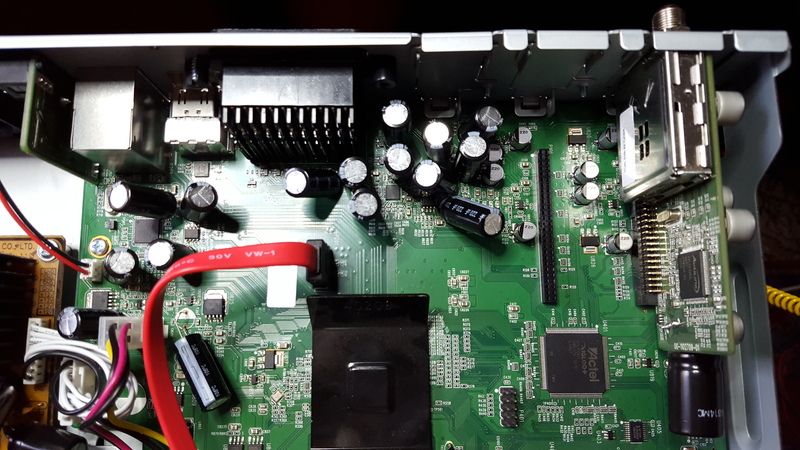 Grim Determination Phase – The SMD type Capacitors are clustered around the pair of Motherboard sockets that the Tuner Modules plug into – access to them is difficult as they are blocked (for soldering access) by nearby conventional Capacitors also some of the SMD Capacitors are very awkwardly positioned next to the tuner sockets which will make SMD Capacitor replacement more difficult – nevertheless I start de-soldering the SMD Capacitors and end up having to remove some of the nearby already replaced capacitors as access for soldering the SMD Capacitors is proving very problematic – eventually all the SMD Capacitors are successfully replaced and upgraded with superior replacements and it is done! The Relief Washed Over Me Phase – With some trepidation (as there was now not that much more left on the Motherboard to replace – so this had better work or I will have to resort to deploying my Oscilloscope – Why is it that Vu+ like similar Korean Manufacturers produce no known service/repair manuals for their hardware? The implication being that the Koreans want you to just throw it away when it fails) I rebuilt the Duo2 for the second time – left the lid off – plugged it in, threw the rear mains switch and held my breath – it is booting….. – boot progressing quicker than before……… – picture on screen – it is actually working and is totally stable, changing channels, Picture in Picture from a separate second tuner input (both channels simultaneously on screen & both simultaneously in HD) all good – nothing I can do is tripping this Duo2 up! In any event Aluminium Electrolytic SMD Capacitors that would actually be a measureable improvement in performance AND Endurance were so expensive it made sense to do more research and use carefully selected Polymer SMD Capacitors instead for a superior upgrade with outstanding endurance and stability – Five SMD Capacitors were fitted to the Tuner Card plus a massively up-rated non SMD type Capacitor – then changed two more capacitors beside the VFD on the front display panel circuit board – and finally there were no more capacitors left to change! Perfection at Last – Reassembled and power on – this time it boots from cold like a rocket and puts a picture on screen so fast it beats the Plasma Televisions automated (by programmable remote control) start up routine meaning a picture is on screen the moment the Television screen is lit up & ready not the other way round like it used to be (before the Duo2 repair it was:-TV screen on, but no picture & waiting for the Duo2 Picture source to come on line) – extremely fast channel switching, very responsive menus, outstanding remote control response and no more interference bars when another tuner switches on or off (for a timer recording or Picture in Picture etc.) annoyingly my other (so far still working OK) Duo2 is also doing the Tuner interference bars fault and is slow to respond to the remote (by comparison) – however after all that work and research a nice side effect is that the Software the Duo2 was running (when it stopped working) is now working very well (don’t even need to bother re-flashing this Duo2!) – previously I suspected it was causing most of the problems but it was failed Capacitors all along! Temperature Readings – shown onscreen (information menu) have also plummeted from well over 40ºc down to only 26-27ºc even when running for hours! – probably due to increased efficiency – meaning that I can touch the top of the now cool CPU with my finger which tallies with the on screen temperature reading so all good all round – with a massive performance increase to boot – this is the Duo2 Vu+ should have built in the first place – the picture quality is outstanding – easily better than new – with sublime new levels of intricacy, colour and detail PLUS £400.00 recovered on this previously useless Duo2 that would not come out of standby and was out of warranty. Exceptionally fine uprated 10,000 Hour Capacitors as far as the eye can see….. Fringe Tuning Benefits – Now I can pick up all those distant and previously too flaky to watch channels – On screen the signal strength and signal quality percentages have both gone up between 7 to 12% depending on the channel – that would be my extreme upgrade capacitor choices on the Tuner Module (those next generation technology imported [Polymer Chemistry] Japanese SMD Capacitors strike again!) combined with the massively upgraded in value and specification conventional Capacitor now increasing the overall length of the tuner module – in some in circuit applications Polymers just don’t work in practice in a circuit so instead you fit a huge conventional upgrade Capacitor if you have the space to fit it in – and in this tuner application happily there is plenty of space! The same tuner modules also fit other Vu+ receivers like the Solo4K, Uno and the Ultimo etc. 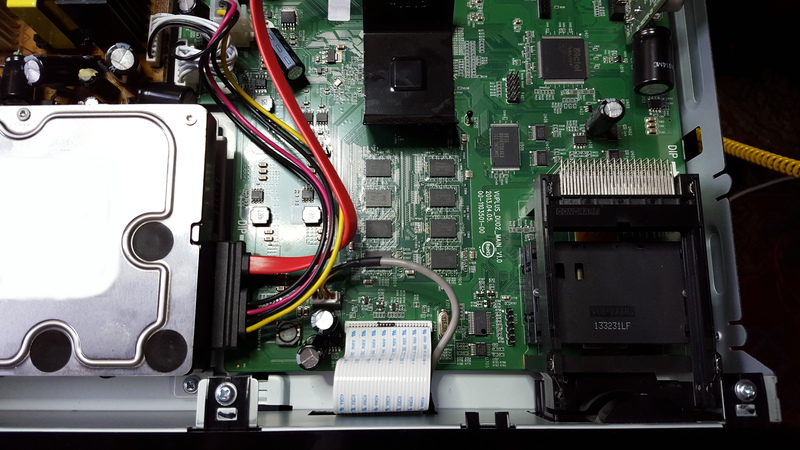 BTW the Solo4K PSU & Motherboard are built together on a single Printed Circuit Board (they are in no way separable) which if you think about it – is either a very bad or very good development! It Had It Coming – My other standard spec. Vu+ Duo2 was now a total embarrassment in terms of performance, remote control response and picture quality etc. compared to my rebuilt Duo2 – you only realise after you compare the untouched Duo2 with my hardened rebuilt version – damn the useless warranties the satellite dealers give out (if you try warranty claiming satellite dealers just keep you talking saying the box needs an update/restore/re-flash/clean re-flash or its “user error” or the oldest chestnut of all time “software driver conflicts” so why does flashing back to an old software version not fix it then?) – so imported yet more Capacitors (I was short of the ones with low or no Minimum Order Quantity) & pounced on it with yet more Soldering & Capacitors – then after all that also had a very late response back about a technical performance question I asked a Japanese Capacitor Manufacturer regarding a particular choice between two different capacitor ranges which are fitted in a couple of places (different values at each location) on the basis of their answer have made a further change to the capacitors involved which (comparing the pair of upgraded Duo2’s) has further improved the picture quality and also reduced the measured mains energy consumption of the originally repaired Duo2 – so the other Duo2 (that was upgraded BEFORE it failed) will get the final refinement of the rebuild ASAP! 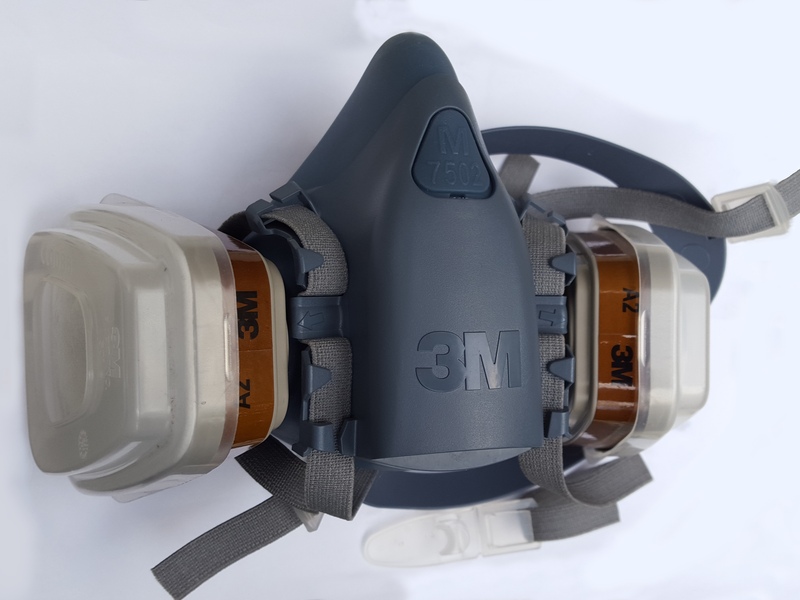 This is a Respirator fitted with two disposable cartridges and two disposable paper filters clipped onto those – this worked where the disposable paper dust masks totally failed to keep the noxious Duo2 soldering fumes in check – you have been warned! Health and Safety – Wear a respirator / gas mask NOT a paper disposable dust mask while soldering the Vu+ Duo2 – Not certain what is causing it but something noxious on the Duo2 circuit boards is extremely irritating to the lungs – dust mask proved totally useless – next day was wheezing and had broken out in spots where the edge of the paper dust mask was on my face despite trying different makes of solders and lead free solder as well as conventional lead solder still the excess smoking/fuming during soldering operations persisted – de-fluxing before de-soldering etc. did not help either – there was a hell of a lot of flux leftover from Vu+ manufacturing processes on both my Duo2’s which despite today’s various “No Clean” Flux formulations – it is still better to clean off and remove permanently any and all leftover Flux for the ultimate in long term reliability and operational stability – the only reason hardware manufacturers leave the flux on is it saves them time and money. Ideally do the Duo2 soldering outdoors because of the terrible fumes but you would need really still & warm weather conditions in a sheltered area – a good gust of wind could easily cause a bad / dry solder joint with the level of precision required for the Duo2 motherboard – don’t forget the ESD precautions or you can end up with a totally software corrupted & bricked but electrically perfect Duo 2! Since Rebuilding my pair of Duo2’s – I have successfully also rebuilt a third (initially totally dead) Duo2 for a friend – as I still have leftover capacitors due to minimum order quantity requirements – he is delighted with the repair and euphoric to be able to go back to a high performance / no compromise Duo2 because previously he decided to be pragmatic (about his dead [out of warrantee] Duo2) by replacing his dead Duo2 with a “Dealer Promotion” £99 Satellite receiver which in longer term use (compared to the Duo2) proved to be unbearable as it was so slow & restrictive in general that when the £99 Satellite receiver also started playing up he decided to stop making his Satellite equipment dealer any richer (he felt he would end up having to buy yet another £99 garbage satellite receiver nearly ever year) got his £99 BACK from the dealer & is sticking to his now repaired and upgraded Duo2 instead! Mega, I wish I had the balls to do my duo2. Do you have list of the caps? 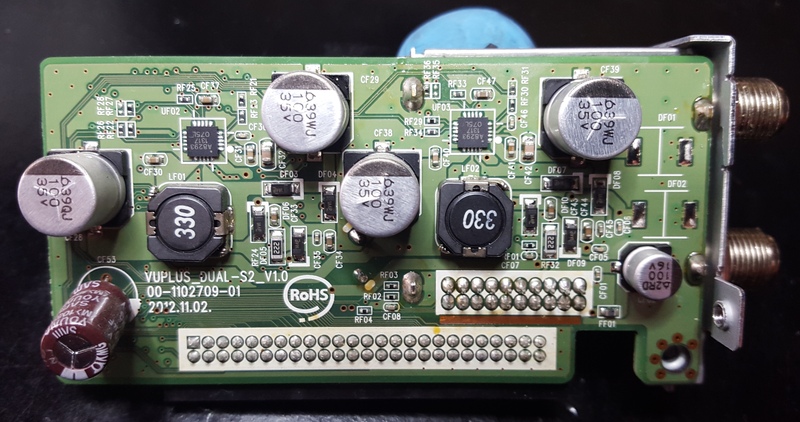 Of course we have a list of all the Capacitors we use – Since writing this on 09 November 2015 people have been making contact via this Comments Section and we have been sending out our Capacitor lists to them BUT most people in practice turn out NOT to have enough soldering skill so end up paying us to rebuild their Duo2 instead – you need to be very competent and experienced at soldering to successfully change the SMD type Capacitors BECAUSE one of the people we DID give the Capacitor list to thought they were competent on SMD Soldering but instead ended up rendering their Tuner Module PCB totally un-repairable scrap – they then paid us to repair their Duo2 and once the new tuner module was fitted (their SMD “soldering” attempts had destroyed the original one) their Duo2 came back to life – fortunately they had not touched the Motherboard but they did have to buy a new Tuner Module. Another person who got a Capacitor list did change the Capacitors on the Power Supply but they then found it “impossible” to change any of the Motherboard capacitors – Motherboard (& Tuner Module) is multi-layer DOUBLE sided PCB with plated through holes – PSU is only a SINGLE sided PCB & NO plated through holes – the Motherboard work requires significant skill and experience the Motherboard is NOT an item to learn to solder with! 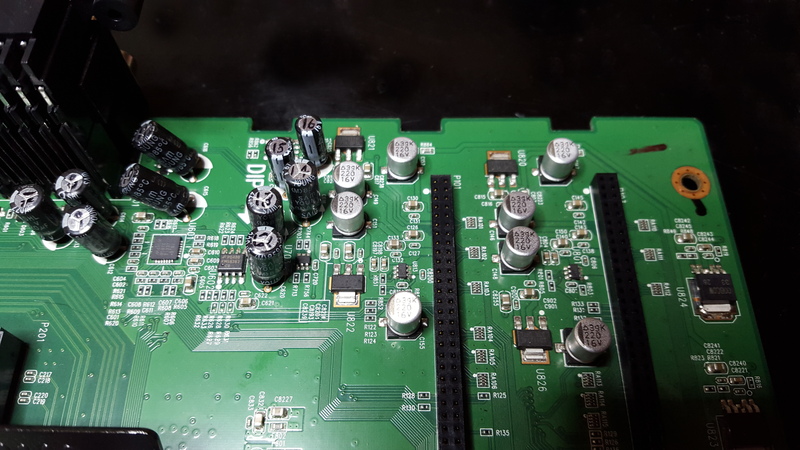 Fortunately they caused no PCB damage instead paying us to complete the repair and their Duo2 then sprang back to life – that is why we are no longer giving out Capacitor lists. hi would you upgrade the capitations and SMD in my vu+ duo 2? i am willing to pay for your time and efforts? We are happy to change ALL 40+ of your Vu+ Duo2 capacitors for you including all the SMD capacitors as well – all our customers have been very pleased with the results of our upgrade work – we also bag up and return all your old capacitors to you! can u send me the list of caps? Sorry for the late reply – am very busy repairing Duo2’s – sudden increase in volume of repair work. Sorry – no more capacitor lists will be given out. Mine has died last night also. First a tuner “disappeared” no free tuner in PAP mode, than have not decoded the cards. Should you be interested an another refurbishment, please contact me. We have successfully repaired your type of fault many times over the past year. We are happy to help you with your problems. You don’t need to scrap your expensive Duo2 just yet – We can solve your problem – have successfully fixed loads of these faults – have just E-Mailed you. Greetings – you successfully repaired my Duo2 nearly a year ago – then my Brothers Duo2 and my Cousin in Tottenham’s Duo2 but why did none of us get mentioned on your website despite between us doing significant business with you? All three Duo2s are still absolutely perfect and as promised better than new but why no website mention? Anyway, I want my second Duo2 fixed because it is also now absolutely stuck. Because you do business in a very business-like way! There was no need for any public comments Faisal as your family also got straight down to business. We are sorry if we accidentally gave the wrong impression to you re public website comments – we will increase your customer referral discount as a goodwill gesture and also apply it to this transaction. To clarify we only ever make a very small number of all submitted comments public in this case it is because you are making a worthwhile point which should be made public for clarity – there are various other reasons why we might make a particular comment public – one of those other reasons being a TOTAL LACK of business-like approach from some customers – we find they become remarkably business like with a bit of publicity! So, it is our implied mark of respect towards you Faisal that only now on the fourth separate Duo2 upgrade/repair for you (and your family) that we are making this comment public at your request. We are delighted that all the Duo2’s we fixed for you are still serving your family well. Best Regards – your second Duo2 will be fixed and ready before the weekend. thanks for your topic . lcd is white . can i repair it with capacitors change ? i put setting of lcd brightness to 10/10 ( in all mode ) in lcd4linux for few weeks . Have taken a look at your forum posts. 1.The fastest way to determine where the fault is will be to try out another front panel. 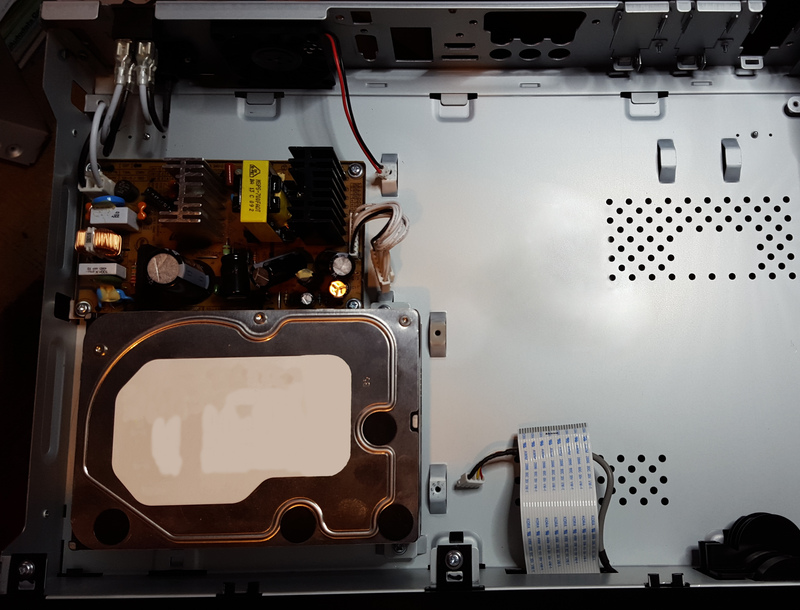 2.It is possible your capacitors have already failed and blown your LCD Display – beware of blowing another LCD if that is the case! 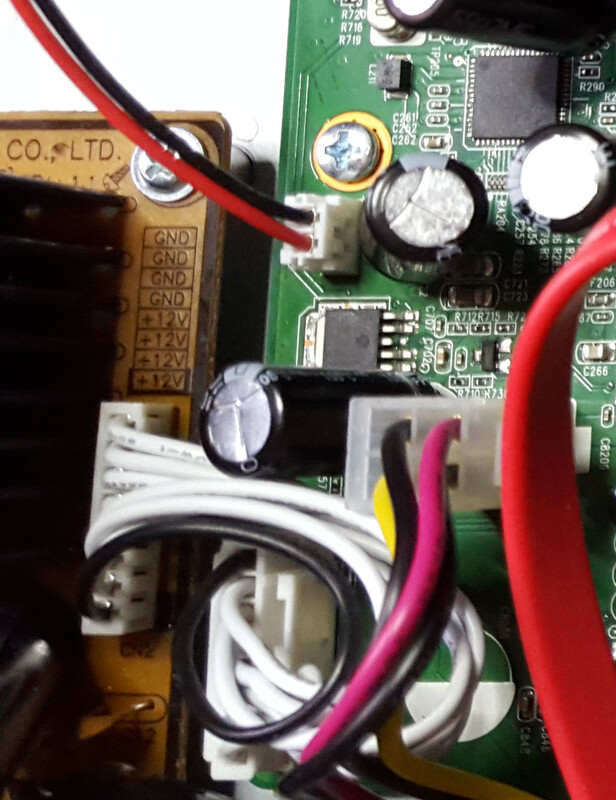 3.Your LCD could just have had a manufacturing fault – so your capacitors might be fine. 4.How old is your Duo2? 5.Is your Duo2 subjected to a lot of heat? OR does it live in an air-conditioned room? Heat speeds up electronic ageing. 6.Cleaning contacts with a pencil eraser can cause Static build up (ESD) and blow components i.e. 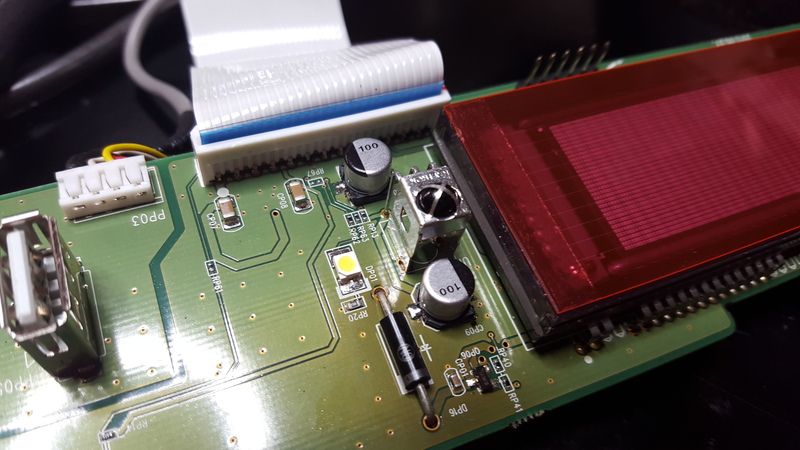 LCD controller chip within the display module. 7.This all might just be a software issue – try a different image. 4 – 3 years . 5 – no . i put it on the laptop cooler and always it runs with single power ( not used receiver USB ) . 6 – can you marker for me ” LCD controller ” In the picture . 4 – 3 years . Your original Vu+ factory fitted capacitors are by now mostly kaput because they are of low quality. 5 – no . i put it on the laptop cooler and always it runs with single power ( not used receiver USB ) . Laptop cooler will not cool this type of equipment effectively – so the room is not air-conditioned – so the Duo2 runs hot – what temperature does the Duo2 report it is running at? 6 – can you marker for me ” LCD controller ” In the picture . 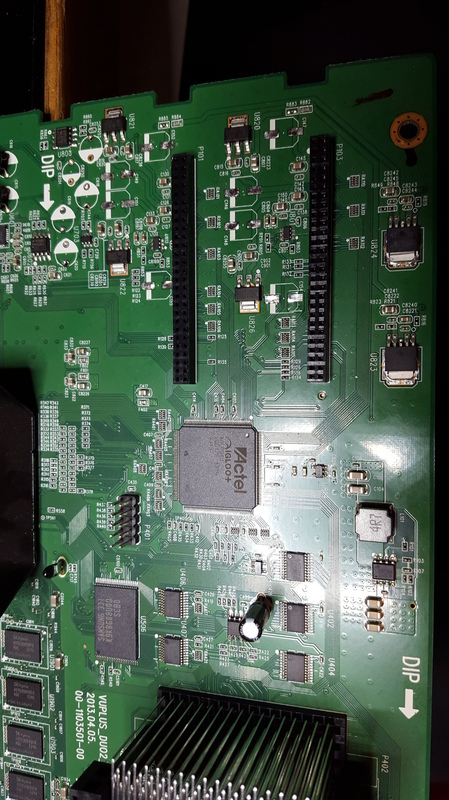 A microchip on the LCD module itself – I have seen 3 different versions so far – one with chip on the back – another with chip on the back under a blob of epoxy glue and a third version with no chip visible so it is probably mounted on the other side of the circuit board (which I am not going to take apart just to find out – if I come across a dead one I will disassemble it and see inside). 1 – can i replace all capacitors ( aluminum and polymerize ) with solid capacitors ( SMD – polymerize ) ? 2 – please send me the complete list of capacitors that i must changed in duo2 . 1. No you cannot (we have experimented) – we have developed a proven formula that works and enhances performance / stability / endurance. 2. Sorry no capacitor lists – “capacitors that I must changed”? All of them! Have repaired a few Duo’s in the past and my Vu Duo2 is still performing ok but would love to have a copy of your capacitor list. Could you also please inform me what you charge for the component replacement on the Duo2? We charge £225.00 GBP for the parts and work detailed above – that is based on the customer delivering and collecting their Duo2 – we can also collect and deliver via our nationwide agents which generally adds another £25.00 GBP to the cost. Have repaired some Duo2’s internationally – priced on a case by case basis. Sorry no more capacitor lists will be given out. If any of the previous members that did receive a copy of the capacitor list would be so kind to private message me a copy I would be eternally graceful. If any of the previous members that did receive a copy of the capacitor list would be so kind to private message me a copy i am willing to pay for your troubles. Have an original copy of the list you want – but this is not a forum so cannot see how anyone can Private Message you (or anybody else) – tell me how am I supposed to PM you so I can let you have my copy of the list. If you could email me on ???????@???????.??? that would be awesome. Good point, I never even checked. I would be very appreciative if you could email me a copy of the component list to ???????@???????.??? this email is correct . hopefully someone can email me. 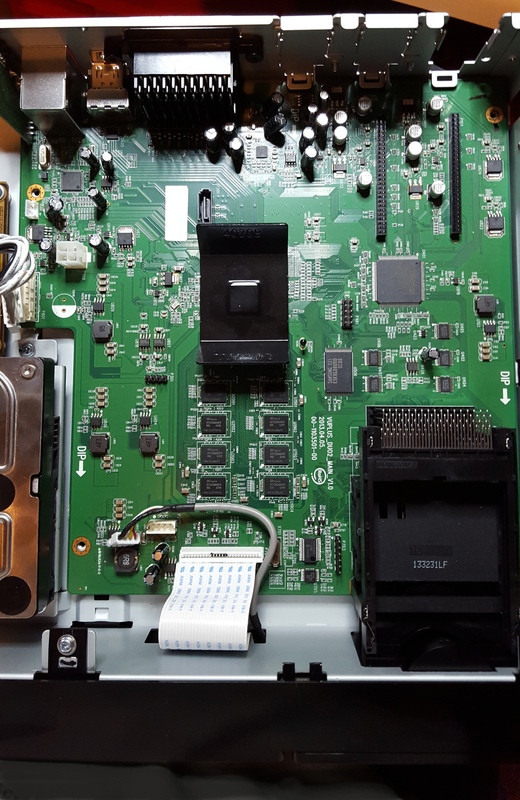 Thank you for fixing my Duo2 your rebuild procedure results in quite delectable new levels of picture detail – absolutely better than new – now I see why you have the confidence to give three-year warranty with rebuild procedure you carry out. It was worth queuing up for your skill and expertise even though I was resigned to the financial loss when I had to retire my (faulty) first Duo2 to the loft and having bought another Duo2 the queue delay did not matter to me anyway. While I was initially extremely annoyed (force of habit) that you re-flashed and changed the operating image on my Duo2 (not that the old image was working that well or properly) you did leave intact all my old original recordings and I have now discovered and realized the many “hidden benefits ” and whole “new world of entertainment” of the different operating software image you changed me over to! Also, list of instructions you gave me of how to alter the positioner to motor connections and related control settings perfected my 1.2 Meter Motorized Satellite Dish ability to change satellite WITHOUT overshooting target satellite (which used to result in no signal) – Excellent! This detail is very important for successful unattended timer recordings. Subtle Vu+ entertainment is to be had reading comments of those demanding “component/capacitor lists” first from your company, then each other – they even repeat the same spelling errors while quoting each other (do they really mean “graceful” or “grateful” because to me they are “greatFOOLS”) then they are so inept they get their own email address wrong and have to correct it with another second message! They bring to my mind ancient Chinese proverb my Grandfather used to drum into me “Ignorance makes Proud while Knowledge makes Humble” – obvious that “capacitor/component list” seekers are full of nothing but empty pride and ignorance they are behaving like vagrant beggars with their pleading for component/capacitor lists while bringing dishonour to your website – curb their foul behaviour. P.S. Very handy you accepted BitCoin payment – When my other Duo2 becomes more unusable you will immediately have another repair from me. I certainly don't have a spare £250.00 laying around. Immy you are the one who has said in public comments (February 27) that you are willing to pay for the capacitor (component) list. I have emailed you a couple of times about your payment offer (after you made your comment) but you have still not responded after some time why is that? Either say how much you are willing to pay (and how exactly you will make payment) for the capacitor (component) list now in public comments or everyone will see that you are a dishonest two faced liar – meaning no list from me for you and I know you got my emails from the read receipts. I can see from the comment on 10/03/17 by (HUEY) he is still waiting for you to message him, i bet you haven’t? just because i mentioned money you jump on here calling me dishonest and a two faced liar when i have not received a single message foam you apart form on here, just goes to show what and individual would go threw to make £..
if you want to give me a copy of the list we can discuses what the it is worth to you. i am waiting to here form you. Immy you old timewaster you! So that is why you deliberately posted a second message on the same day – 7 March at 5:15AM AND again the same day at 9:03AM – saying that you gave the wrong email address in the other message – that way you can always hide behind the “wrong email address” excuse to waste time and do absolutely nothing – Immy your talk is soooo cheap. I don’t believe you really have two Duo2’s – I can’t believe your mother let you buy even one! – if you do that is around £800 of dead Vu+ equipment you are stuck just sitting on – either you have to take your big loss on both Duo2’s and throw them out or you fix them both – Immy you are worse than a ranting hysterical woman who can’t make up her mind – your pathetic dithering is sickening. Immy who are you to even dare to tell me to message Huey? Unless Huey is your minion / how you are trying to avoid paying up. Immy you are the one who made this list all about money by offering payment (out of the blue) in the first place on 27 February. Immy as you are in such a total mess with your TWO (???) unusable Duo2’s – I just might consider taking you up on your offer of selling the list I have. Immy considering you are sitting on a great big large £800 sized Duo2 financial dead loss I might entertain offers in excess of at least £135 for the list. So Immy make your offer in public this week or prove forever that you are in fact a contemptible, timewasting, dishonest, two faced liar. Sorry I could not moderate the comments in the Junk Folder any faster – I am extremely busy nowadays repairing Duo2’s. It should be pointed out that the software that runs this website has built in Spam / Junk E-Mail / Auto-Censoring of Foul language etc. filtering built in to it as standard and that several hundred messages a week automatically go straight in to the Junk Message Filter Folder and overall the system is pretty accurate and a great timesaver. However, when people start using foul language etc. to one another PLUS make many typing/spelling errors those messages are automatically flagged as Junk and so also go straight into the Junk message folder. I do not have time to regularly check the Junk message folder because I am extremely busy fixing Duo2’s. Excellent repair and rebuild – my dead Duo 2 is now working again and better than new. Channels are now all clearing instantly and also free of any frozen picture issues across WAN connection even though I am using the same provider as before but at last no more freezing while watching sports. Will be back for more of the same very soon. Sorry to have wasted everyone’s time. Have just had to pay a big fine so at the moment don’t have any money left to do anything with anyone. Realised that fixing a Duo (one capacitor only) is nothing like fixing a Duo2 (ALL of the capacitors!) – so once I have saved up some money I will ask you to repair my Duo2. Can I please pay you for the Duo2 repair by instalments?